Immigrant Pathways Colorado Enables $20,000 in Scholarships! Immigrant Pathways Colorado has partnered with Arapahoe Community College Foundation, donating $10,000 to the Foundation for scholarships at the college for low income immigrants and refugees. The donation will be matched by the Arapahoe County College Opportunity Scholarship Initiative, meaning that $20,000 in scholarships will be available to New American students during the 2019-2020 school year. It is the third year that Immigrant Pathways Colorado, a community-supported nonprofit, has donated to the scholarship fund. 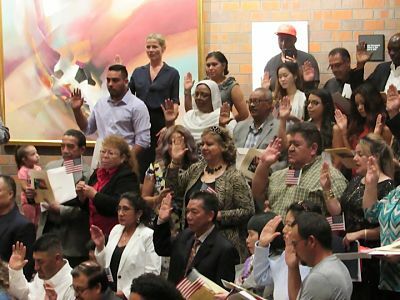 Forty citizenship applicants from 23 countries took the Oath of Allegiance and became U.S. citizens in the Littleton City Council Chamber at the Littleton Center. The ceremony was hosted by the Littleton City Council, the Littleton Immigrant Resources Center (LIRC), Bemis Public Library and U.S. Citizenship and Immigration Services (USCIS). The 40 citizenship applicants were originally from more than 20 countries: Belarus, Bulgaria, Burma, Canada, Chile, China, Cuba, El Salvador, Ethiopia, Honduras, Iraq, Iran, Japan, South Korea, Lithuania, Mexico, Mongolia, Morocco, Russia, Somalia, Taiwan, Ukraine and Vietnam. Naturalization is the process by which U.S. citizenship is conferred upon foreign citizens or nationals after they fulfill the requirements established by Congress. Naturalized citizens enjoy nearly all the same benefits, rights and responsibilities that the Constitution gives to native-born U.S. citizens, including the right to vote. During fiscal year 2017, USCIS naturalized 716,000 immigrants. Since 2007, the City of Littleton, through LIRC, has been providing citizenship instruction. LIRC serves permanent residents in the Denver metropolitan area. LIRC received a $250,000 grant from USCIS in fiscal year 2016 for a performance period of two years. With this funding, LIRC provides citizenship instruction to 240 permanent residents and naturalization application services to 300 permanent residents. 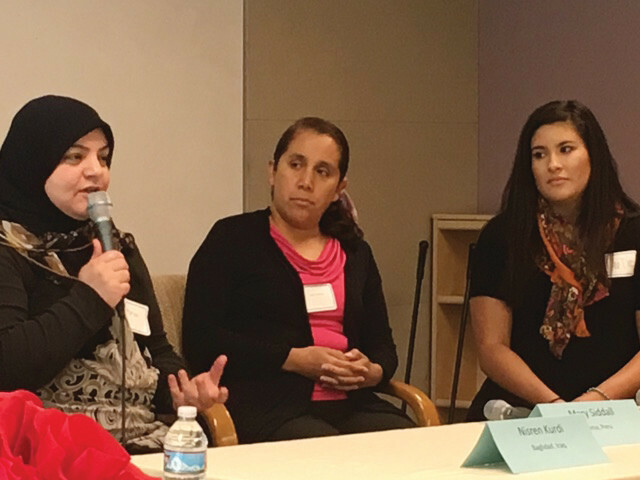 A panel at the May 4 Immigrant Pathways Colorado discussed their stories related to coming to Colorado and becoming citizens: Nisren Kurdi from Iraq; Mary Siddall (Lima, Peru) and Dee Diaz (Maracaibo, Venezuela) were led in discussion by Connie Shoemaker. About 75 supporters of Immigrant Pathways Colorado gathered at the Littleton Museum for conversation, lunch and inspiration on a sunny May 4 — and to hear stories of three IPC grantees. Susan Thornton spoke briefly about the organization’s programs: grants for English language study, GED test preparation, conversation circles, application for a green card, self-development, and new this year — a scholarship at Arapahoe Community College for a refugee or immigrant. She introduced a panel, led by educator Connie Shoemaker, who has aided many students of all ages and origins and is a co-founder of Immigrant Pathways. She introduced Nisren Kurdi (Missy) from Baghdad, Iraq; Mary Siddall from Lima, Peru; and Dee Diaz, formerly from Maracaibo, Venezuela. The first question was: Why are you here? Mary Siddall, who was assisted with a grant to help her become a citizen, said she wanted to come to America to learn English and she wanted to come legally, so she arrived as an au pair and planned to stay one year. But, she met her future husband and went back and forth for a while, deciding there was no practical way to stay in Peru, which she described as “kind of safe” for a young woman who grew up in an upper-middle-class family. (But there was no secure hiking path like the High Line Canal — she is grateful for the security.) “I will call this home now,” she said, speaking of her business as a life coach. Her first day in the U.S. was actually at age 11, when her mother sent her on a kids’ tour to Disneyland. “It was so clean, organized, perfect. I tried to go every few years …” The hardest thing? She had been accustomed to having servants at home. “My husband had to teach me to cook! I didn’t have an education. I was lonely. In Peru, you open a window (on the street) and people stop to chat — here, no one stops to talk.” She became a citizen so she could vote. Since it was founded in 2009, the Littleton Immigrant Integration Initiative has expanded its coverage across the metropolitan area, according to the chair of the busy nonprofit. It has offered assistance to immigrants from around the world as they are integrated into our communities via self-development grants. Grant money has gone for English language classes, tools for work, professional certification, obtaining a “green card” and naturalization and citizenship requirements. At an April 21 donor appreciation luncheon, a new banner was unfurled. The organization will continue its program of “one immigrant at a time,” assisting people from across the world, under a new name: “Immigrant Pathways Colorado.” The change reflects outreach across the metro area. The initiative has assisted 36 individuals with citizenship applications, which can cost from $800 to $1,000 — a large amount to limited-income families. They have come from Bolivia, El Salvador, Ethiopia, Ghana, Iran, Iraq, Mexico, Nicaragua, Peru and Venezuela. 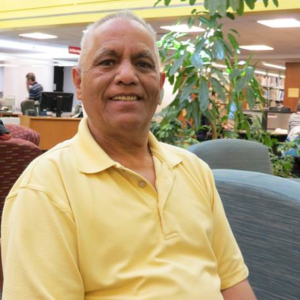 Currently, they receive about 19 requests a year, some through Littleton’s Immigrant Resources Center at Bemis Library, where the busy agency helps with English, connection to community services and application for U.S. citizenship. A recent example that chair Susan Thornton cites with pride is the need of a young woman from Ethiopia who had passed her examinations to become a physician, but couldn’t afford to travel to interviews for a residency. She is happily situated in a program in Chicago, thanks to a grant. Immigrant Pathways Colorado is completely community-supported. Fundraising events will include an annual campaign, a fall Taco Bar at Platte River Bar and Grill, with silent auction (they are looking for items) and an end of the year “ask” letter. The April 21 luncheon speaker was journalist Helen Thorpe, who is author of “Just Like Us,” a story of four immigrant girls (two were documented citizens and two were not). Thorpe followed them for six years — out of high school and into college — including to parties, Mexican dance halls … “it was eye-opening to spend time in the Spanish-speaking Latino community.” She hung out with the girls as they dressed for a prom. The father of one was determined to go with her. The girls dealt with two cultural traditions. Thorpe hopes to help more Americans realize how hard it is to become a citizen. Those here illegally have to return to their country and apply from there — which can take years. “I want people to understand about the undocumented life,” Thorpe repeated, saying she was still closely in touch with three of the girls. Immigrant Pathway Colorado is proud to announce the receipt of a generous grant of $5,000 from the Buck Foundation of Littleton in September of 2015. The grant will help cover operating costs and increase the organization’s outreach and fundraising ability. The Buck Foundation is a family foundation with a commitment to peace and social justice that supports children, youth, women, and minorities. It was founded by Douglas H. Buck and Mildred M. Buck in 1986 and benefits from continuing involvement and support by their children and grandchildren. Based on the progressive values of the founders, the Buck Foundation maintains strong family values to help those most in need, and to work closely within the community to build a just world. Values of compassion, justice, fairness, inclusivity, and equality are central to the foundation and our philanthropy. The Buck Foundation originated in Colorado and continues strong associations there, although no family members currently live in Colorado. Over the last 27 years small grants have been made to non-profit organizations, mostly in the Denver area. 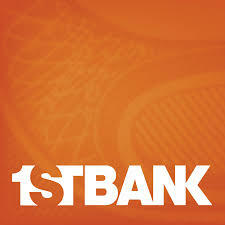 Some grants have been made to organizations in East Maui, Hawai’i, and to national organizations. The Buck Foundation makes grants through a responsive, open application process once each year. If you have not received a grant from the Buck Foundation in the past, you are required to complete an online letter of intent by February 15th. Full Grant applications are due on April 15th for those applicants who have received a grant from us in the past and for those new applicants who received an invitation to apply. The Foundation supports grassroots organizations, often overlooked by mainstream philanthropy, that build a more just society by dealing with issues of human need, education, community development, support to immigrants, and the advancement of social justice and peace among nations and peoples. We support community-building activities, and we favor programs and organizations that are led by and work with people living in poverty, immigrants and refugees and people of color. The Buck Foundation values innovation and welcomes organizations prepared to take risks to address pressing social issues. Recently a supporter of Immigrant Pathways Colorado very generously donated $1,000 in memory of her mother, Helen K. Amter. The donor said that her mother was a wonderful woman and a force behind many social justice activities — similar to activities of Immigrant Pathways Colorado — during her lifetime. Do you have a family member you would like to honor with a donation? We’d love to hear from you. Contact us.